william fontanez brings the french quarter to any street in his food truck, la gumbo ya ya. Photo by Brent Fuchs. Every day is Mardi Gras when La Gumbo Ya Ya rolls around the corner. 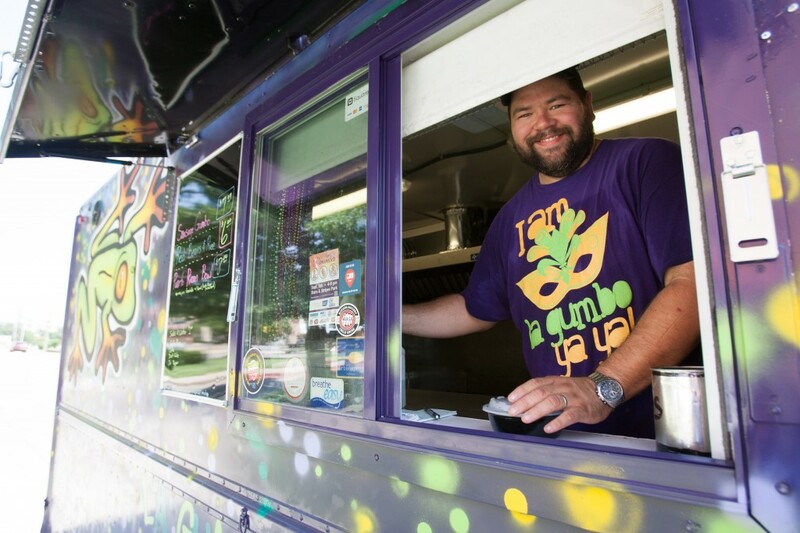 One of Oklahoma City’s most recognizable food trucks – the green, gold and purple striping helps – La Gumbo Ya Ya brings the French Quarter to the scene. Owners William and Rachel Fontanez began their food truck business last year. A U.S. Army veteran, William Fontanez is the head cook. Having grown up in Louisiana, he makes Cajun flavor the “house” specialty, but his Puerto Rican heritage also dashes Caribbean influences into the food. The result is a menu of gumbo (from vegan to ‘gator), Po’ boy sandwiches topped with just about anything pulled from the bayou and an array of entrees and sides with a decidedly tropical taste. Pulled pork and roast beef are succulent and tender for the open-faced sandwiches, and dishes like red beans and rice have struck a high note with La Gumbo’s fans. But offerings such as fried plantains, yucca fries and other specialties that hail from island living make this kitchen on wheels a standout in the buzzing food truck world. And, if that wasn’t reason enough to catch up with La Gumbo, we hear that the beignets are perfectly dreamy. Catch up with the spirited Fontanez and La Gumbo Ya Ya at www.lagumboyaya.com.